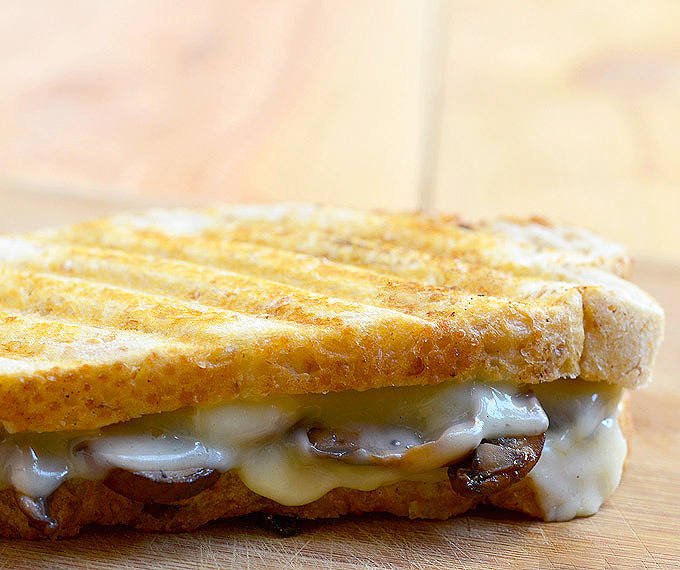 Portabello Mushroom Sandwich Melt with meaty mushrooms and gooey Provolone cheese on toasted French bread is the easiest and tastiest sandwich you can make! Perfect for a midday snack or light lunch! Portabella mushrooms sauteed in garlic and dry sherry are one of the staple things I regularly make and keep in the fridge for quick meal options. I like to use toss them with pasta for a meatless lunch, pile on burgers for an extra layer of yum, or top on flatbread or flour tortilla with heaps of cheese for a stress-free pizza night. 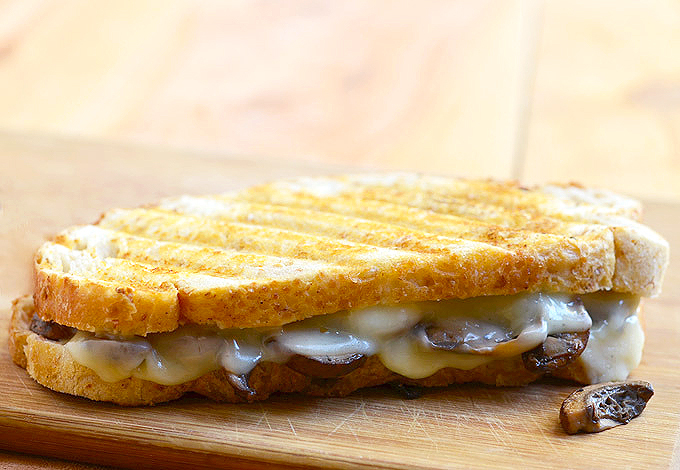 My favorite way to use them, however, is this portabello mushroom sandwich melt. 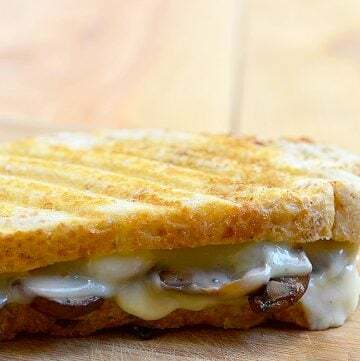 With meaty, flavor-packed mushrooms and melty, gooey Provolone cheese on crunchy toasted French bread, it’s seriously the easiest and tastiest sandwich on earth! I love this vegetarian sandwich on hearty French bread slices but feel free to use sourdough, ciabatta, or even the everyday wheat and white bread. The cheese is fair game, too! Creamy Provolone cheese is my top choice but Swiss or Pepper Jack are also great swaps. You can grill the sandwich until gooey and melty and toasty in your trusty cast iron skillet or in a panini press if you happen to have one. That George Foreman grill gathering dust in your kitchen cabinet? Also great for making grilled cheese sandwiches! Use a damp paper towel or brush to clean mushrooms of grit and dirt. Do not wash them as they’re very spongy and will soak a lot of water. Use a wide pan and do not overcrowd to allow mushrooms enough contact to the heated surface. Cook on medium-high heat and do not over stir. Give them time to sear and caramelize before turning. 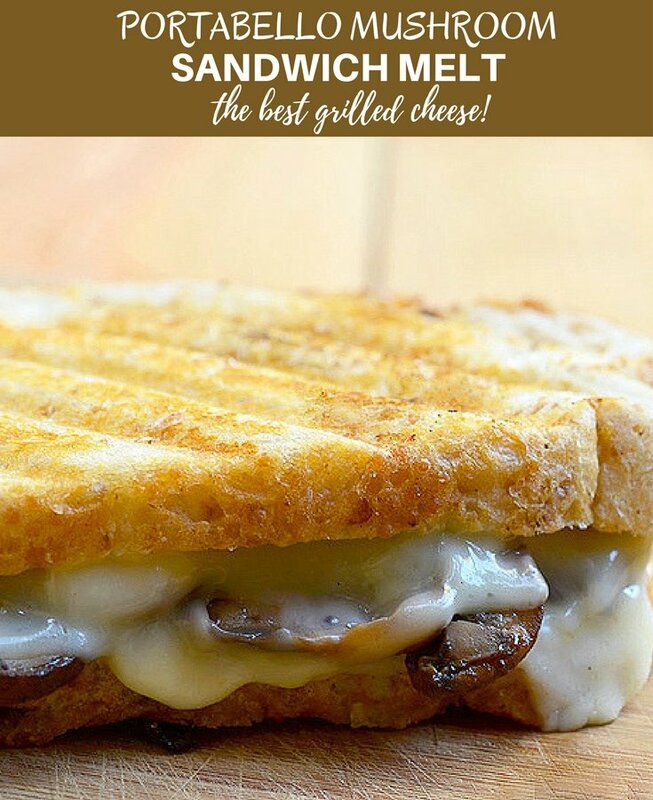 Serve this mushroom melt with a piping hot bowl of creamy tomato or any of your favorite soups for a light yet satisfying meal. Enjoy! Using a damp cloth, wipe mushrooms of any dirt and grit. Slice thinly. In a skillet over medium-high heat, heat olive oil. Add mushrooms and cook, turning them midway, for about 4 to 5 minutes or until lightly browned. Add garlic and cook for about 30 seconds or until softened. Increase heat to high. Add wine. Season with salt and pepper to taste. Continue to cook, stirring as needed, until liquid is absorbed. Spread butter on one side of each of the french bread slices. Assemble sandwich by placing one slice of cheese on unbuttered side of bread, spoon 1/4 of mushroom mixture, add another slice of cheese and top with another bread slice unbuttered side down. In a wide, thick-bottomed pan over medium heat or a preheated panini grill, place sandwiches buttered side down. Grill for about 2 to 3 minutes on each side or until lightly browned and cheese is melted and gooey. This looks so delicious. I love a good sandwich melt but I’ve never had it meatless. Wow you have no.8dea how hungry this sandwich made me. Looks delicious. Thank you for sharing. Ohhh this looks so yummy!!! I’m not feeling great and all i’ve been craving is a grilled cheese, but this looks even better!! This looks delicious! Thanks for the tips on cooking the mushrooms. Grilled chicken sounds amazing! Can’t wait to try it when I make this sandwich again.